I must not have been thinking last spring when I made out the concert schedule for this school year that Memorial Day weekend was about the earliest it could ever be this year. So I put the Spring choir concert in it's normal spot–as late as possible in May, on the Sunday after the senior's last day. It was a couple of weeks ago that a couple of WLA parents caught the conflict with Memorial Day weekend (thank you Sehloffs!) and asked me about it. With the Vajda Hymn Festival this weekend, I've been working on the program and looked ahead at remaining music dates for this school year, and I saw it again–I did put the Spring choir concert on the Sunday of Memorial Day weekend. What was I thinking??? So, to avoid any conflicts with both students and families wanting to get away that weekend, I've decided to move the concert date up one week to Sunday, May 17. The time is still the same (7:00 PM) and the location is too (WLA gym). What's on the program? Among other works that night, the Traveling Choir will be performing the music of Jackson Berkey that they will be singing at their 3rd invitation to sing at Carnegie Hall at 2:00 PM on June 14, 2009. Jaroslav Vajda passed from this life to eternal life on May 10, 2008 at the age of 89. 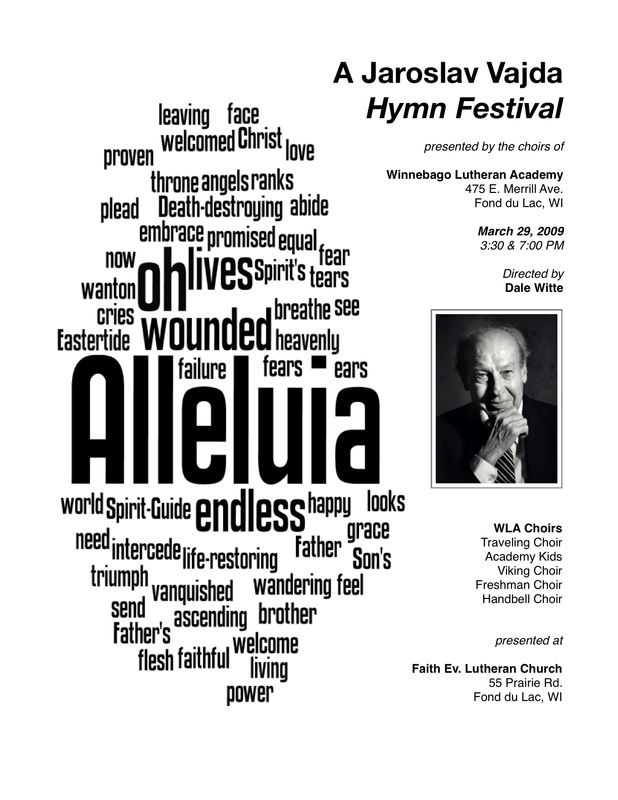 His hymn texts, such as "Where Shepherds Lately Knelt" and "Go, My Children, with My Blessing", have become well known in the Wisconsin Synod ever since Christian Worship was published in 1993. With over 225 hymns texts and translations to his credit published in some 60 hymnals on five continents (all written after the age of 50! ), Jaroslav Vajda was not only "the dean of hymn writers in North America" but was also a blessing of God to his Church throughout the world. A dinner will be served in between concerts in the Faith commons for anyone who wishes to eat. A freewill donation will be taken to assist Traveling Choir students who will be singing at Carnegie Hall on June 14, 2009. One of the hymns that we will be singing on Sunday, March 29, 2009 for the 7th Annual WLA Hymn Festival will be "God of the Sparrow", text by Jaroslav J. Vajda and tune by Carl F. Schalk. Have you ever struggled to understand what God's Word means, or what a hymn or song is getting at, and then something happens that you just get it? That happened for me a couple years ago when I heard the Koine version of the Irish hymn "This is My Will" (Christian Worship 497). Up until that time, I didn't really get how to "correctly" perform that hymn. Then I heard them perform it, both live and on one of their CDs (Gesangbuch), and the music and setting suddenly made sense. Well, that just happened to me with "God of the Sparrow." Honestly, I have not understood two things about this hymn: (1) why does it keep asking questions that it doesn't answer, and (2) why has it become, according to statistics given by Carl Schalk to the 2002 WELS National Conference on Worship, Music, and the Arts, one of Vajda's most popular hymn texts? I'm in the process of writing the program for the WLA Jaroslav Vajda Hymn Festival, and I Googled "God of the Sparrow" to speed up the process of retyping it into my program. This video was the first link on Google. I cried...many times. Now I understand a little bit better. Each school year, WLA music students participate in the Wisconsin State Music Association (WSMA) Solo Ensemble Festival. The Solo Ensemble festival gives music students an opportunity to prepare a piece of music (some students enter as many and ten different pieces!) to be judged by a state-trained music adjudicator with the possible opportunity of performing at a state festival or even being named exemplary soloist!. The Flyway Conference has the tradition of hosting the district festival on two consecutive Staurdays in March, alternating instrumental and vocal each year. Last year, WLA hosted the schools of the Flyway Conference for the district solo ensemble festival. This year that responsibilty went to Laconia High School. March 7, 2009 was the instrumental weekend, March 14, 2009 was the vocal weekend, and piano players could perform on either day. Even though March 14 was the first day of spring break for WLA students, almost 50 WLA music students performed in 26 events on that day and 10 of those events were given a "starred-1st" (*1) rating, advancing them to the State WSMA Solo Ensemble Festival on April 25, 2009 at UW-Oshkosh. Congratulations to all the WLA students who performed on both weekends. I am very proud of all of you and how you used your God-given musical gifts!